Buchanan (above) was the only U.S. bachelor president, and King (right) was the only bachelor vice president. They also had the hots for each other. King was vice-president under Franklin Pierce, who was president immediately before Buchanan. King and Buchanan lived together for fifteen years in a house in Washington, DC, beginning in 1836. Buchanan was a one-term president, serving from 1857-1861, in the years immediately preceding the U.S. Civil War. King, a senator from Alabama, was five years older than Buchanan, but King was called “Miss Nancy” by Andrew Jackson, “Mrs. 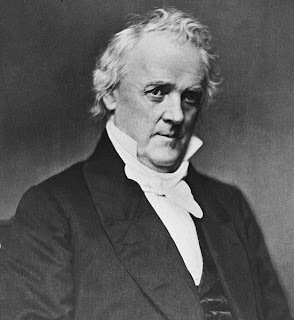 James Buchanan” by James K. Polk’s law partner, and “Buchanan’s better half” and “Aunt Fancy” by others. 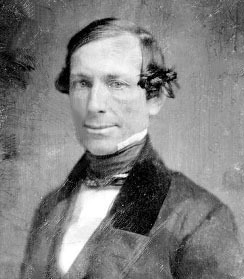 Senator King was noted for his “fastidious habits and conspicuous intimacy with bachelor Buchanan.” Around Washington, Buchanan and King’s sexual orientations were widely rumored to be gay. They were known as the “Siamese twins,” slang at the time for gays and lesbians. When King was appointed envoy to France in 1844, Buchanan lamented, in a letter to a friend that “I am now solitary and alone, having no companion in the house with me. I have gone wooing to several gentlemen, but have not succeeded with any of them.” King died of tuberculosis five years before Buchanan became president. Buchanan and King must have had something to hide, because the two men’s nieces destroyed all their uncles’ correspondence; as well, Buchanan ordered that all his letters be burnt upon his death. Senator King was elected Vice President of the United States on the Democratic ticket with Franklin Pierce in 1852, but took the oath of office while in Cuba, where he had gone due to ill health. This unusual inauguration took place because it was believed that King, who was terminally ill with tuberculosis, would not live to return to U.S. soil. The privilege of taking the oath on foreign soil was extended by a special act of Congress for his long and distinguished service to the government of the United States. Even though he took the oath 20 days after the president’s inauguration day, he was still Vice President during those three weeks. Shortly afterward, King left Cuba to return to his Chestnut Hill plantation in Alabama, where he died within two days, at age 67. "Memoirs of the Ford Administration" gives a slightly different account of Buchanan's sexual preferences. It would be interesting to make a comparison.